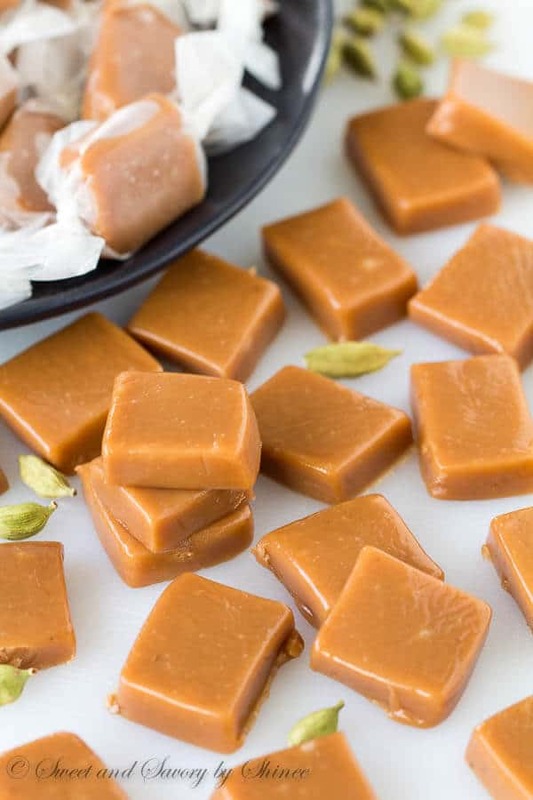 Buttery, soft and chewy caramel bites infused with hint of cardamom. So delightfully addicting! With step-by-step photos and lots of tips. My god, I’m so excited to share this recipe with you. Finally! 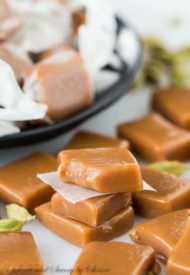 If you’ve never made caramels, or you are intimidated to try your hands at this sticky candy-making business, rest assured you’ll do fine. We are just boiling some butter, sugar, cream and corn syrup after all! Just kidding, not that simple, but almost. I find combining all the ingredients and cooking everything together is the simplest method of all. The secret to success is a candy thermometer. I’m still using Garrat’s grandma’s old candy thermometer, which I should probably replace soon, but it works. (I have this and this on my wish-list, but if you have any recommendations, I’m all ears.) Anyway, new or old, you do need a candy thermometer. Once the mixture comes to a boil, we’ll be cooking it until it reaches 250°F (120°C) and the color becomes dark golden. Sure, you can test mixture by dropping a small amount in cold water etc, but it makes the process that much more complicated, and the mixture can go from perfect to ruined in matter of seconds. 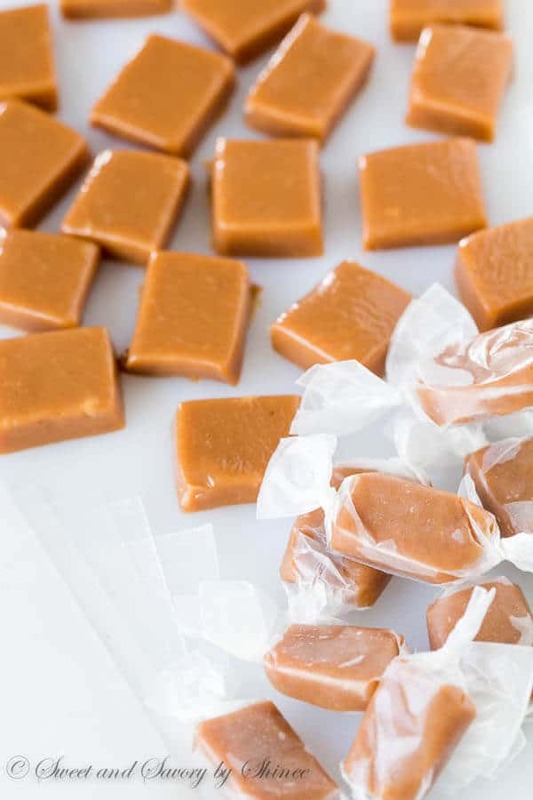 Oh and one more tip, don’t skip the buttering the foil (or parchment or wax paper) before you pour the caramel. I’m embarrassed to admit that I didn’t butter a wax paper once and had to throw out one of the test batches. ? I’ve talked about my obsession with cardamom pods in this post. It’s often overlooked, yet absolutely amazing spice that we all should use more of. The delicate floral flavor of cardamom is infused in these soft caramel bites, making it even more irresistible! If you ask me what’s my least favorite part of making caramels, I’d say wrapping the little suckers. Or should I say cutting perfect squares out of wax paper? Well, guess what? I just came across these pre-cut caramel wrappers on amazon.com and ordered one. Candy-wrapping got a whole lot easier!! So here’s a question for you. Are YOU going to make these? Or are you going to make these? ? 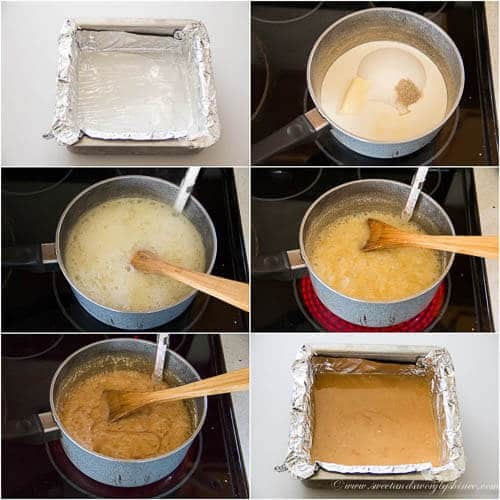 Line 8-inch (20cm) square baking pan with an aluminum foil and generously butter the bottom and sides. In a large heavy saucepan, combine all the ingredients and cook over medium heat until boiling, stirring occasionally. Continue to boil the mixture, uncovered, stirring occasionally, until the mixture reaches 250°F (120°C) on candy thermometer, for 15-20 minutes. Pour the mixture into the prepared pan and spread evenly. Cool completely, about 2 hours. 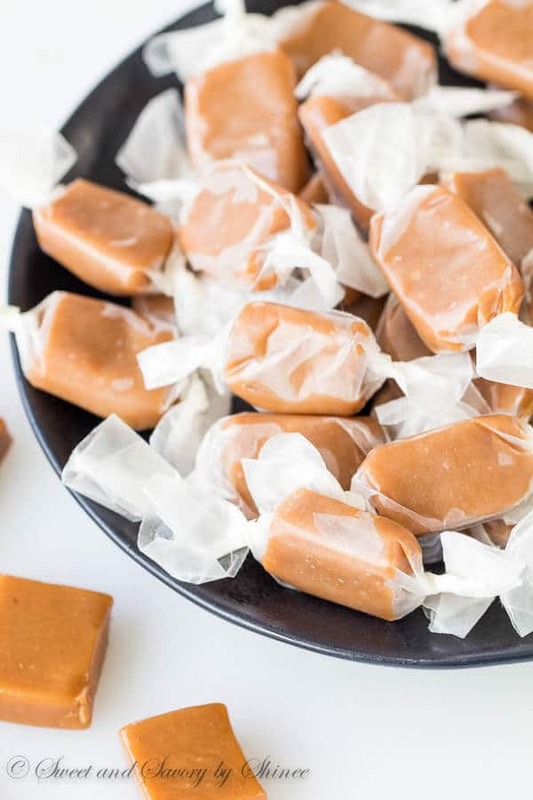 Cut the cooled caramel into small pieces and wrap in wax paper. Store the candies in airtight container. *Because ground cardamom loses its flavor pretty fast, I recommend buying whole pods. I like to lightly toast the whole pods in a skillet, and then remove the seeds from the pods and grind them in a small mortar and pestle. You can use coffee/spice grinder too, but I like to grind only small amount at a time, so electric grinder is too big for this job.